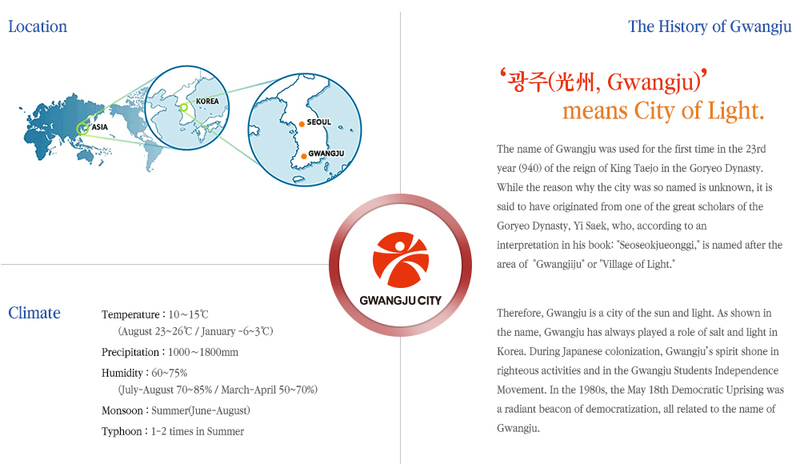 The history of this virtuous city can be followed from the righteous army's movement at the end of the Joseon Dynasty to the Gwangju Student Independence Movement and the May 18 Democratization Uprising in 1980, solidifying its position as a city of democracy, human rights and peace. The May 18 Democratization Uprising, in resistance against the military regime's oppression, had a substantial influence on the democratization movement of many Asian countries that are aspiring to justice and freedom from autocratic rule. On May 25, 2011 the May 18 Archives were listed in the UNESCO Memory of the World Register, and their value in world history was recognized. Gwangju is a city of arts and has given birth to various artists, including LIM Bang-wool, the most renowned Gwangju-born Korean traditional singer, HEO Baek-ryeon (pen name: Uijae), a master of the Southern School of Chinese Painting, JEONG Yul-seong, a Chinese modern musician and PARK Yong-cheol, a Gwangju-born poet. On top of this tradition, Gwangju hosts the Gwangju Biennale and the Design Biennale, international festivals of modern art and design, transforming itself as a cultural capital of Korea and a cultural hub city of Asia. In November 2015 the Asia Culture Center (ACC) was opened to the public, with Korea's longest project (from 2003 to 2023) fostering Gwangju as a cultural hub city of Asia and the Gwangju Design Biennale to be held in 2017. Gwangju hosted the 2015 Summer Universiade which was reputed as a low-cost, high efficiency culture festival that was attended by young athletes from across the world and as a safe, prestigious sporting event that overcame the MERS virus, and accelerated preparation for the 2019 World Aquatics Championships. Gwangju was the city that planted 10 million trees all over the city and implemented the first "Carbon Banking System" in Korea, which spread to other local governments. Gwangju has preemptively responded to climate change by holding the 2011 UEA (Urban Environmental Accord) Summit. Mudeung Mountain, called a maternal mountain, was designated as the 21st national park in 2012. According to the statistics released at the end of 2016, Mudeung Mountain was the second most visited national park by hikers in Korea. Following its designation as a national geological park in 2014, Muedung Mountain's columnar jointing cliff was nominated as one of UNESCO's international geological parks. Gwangju is the Korea’s second largest auto production city. Gwangju-based KIA Motor’s factories are manufacturing 620,000 vehicles annually. With the “One-Million Vehicle Production City Project” passing the central government’s preliminary feasibility study in July 2016, the environment-friendly parts and components cluster establishment project is being actively implemented. Investments worth 303 million U.S. dollars within the Bitgreen National Industrial Complex will be used to establish a cluster supporting development and production of environment-friendly automotive key parts and components. Gwangju is trying to emerge as a future-oriented, leading environment-friendly automotive city through great compromise between labor, management, civil and governmental sectors. In December 2015, the location of Gwangju-Jeonnam Joint Innovation City, also known as Bitgaram Innovation City, the only one of its kind in Korea, was set at KEPCO (Korea Electric Power Corporation) while embodying the establishment of an "Energy Valley." Aiming to invest over 10 million U.S. dollars annually for R&D, attract 500 companies by 2020, and train 1,000 professional personnel, this project focuses on establishing a smart energy hub city, including Bitgaram Innovation City and Gwangju. Seven heads from KEPCO, Gwangju, Jeollanam-do, Korea Power Exchange, KEPCO KDN and KEPCO KPS have guaranteed a joint collaboration in the establishment of an energy valley and devoted themselves to the implementation of this project. An industrial complex is being established exclusively for energy industries and Korea's prominent new energy industry-related companies including LSIS and Hyosung, along with research institutes. With the construction of Gwangju's urban cutting-edge national industrial complex beginning in December 2016, the second phase of the project, including local industrial complexes, is in the process of removing the green belt, while furthering the construction of a new energy hub city.